Disegni di Stampe for Four of Caraglio’s Twenty Engravings. Lyons, Musée Lyonnais des Arts Décoratifs, no. 447/a. Red chalk and red wash (both reddish-orange in tone) over a preliminary drawing in black chalk, 22.3 x 10.8; laid down; wm.? ; some small light stains. Inscribed in brown ink at the lower left: 20013 [accession number]. PROVENANCE: Acquired by the museum (Lugt, Supplément, 1699a, at the lower right, of the Musée d’art et industrie) from the dealer Basset in Paris in 1867 (see M.-E. Béguin below). Béguin, in EdF, 1972, 180, Fig., 181, no. 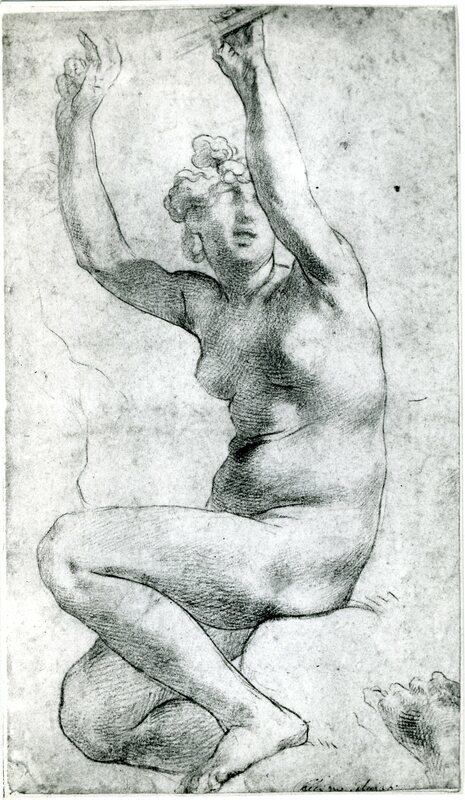 203, as Rosso, for the engraving by Caraglio. She points out that the drawing was formerly attributed to Primaticcio and identified as Rosso’s by J. F. Méjanès in 1970. Neilson, 1974, 169, as Rosso. Borea, 1980, 248, under no. 618. Marie-Éliane Béguin, in La Renaissance, Quebec, 1984, Color Pl. 18, 298, no. 158, and Fig. (wrongly identifying the number inscribed at the lower left as giving Rosso’s name). Lévêque, 1984, 163, 165 Fig. Henriette Pommier, in Dessins…de Lyon, 1984-1985, 26-27, no. 2, and Fig. 2. Carroll, 1987, 9, 10, 24, 37, 39, 40, 96-97, no. 19, with Fig. Carroll, 1989, 12, Fig. 15. Massari, 1989, 119, under no. 36. 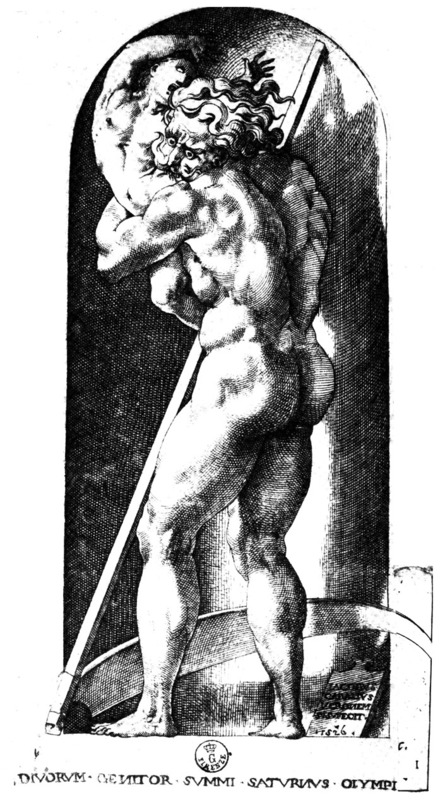 Landau, in Landau and Parshall, 1994, 159, Caraglio’s print betters the drawing. Franklin, 1994, 134, 136, Pl. 99, as Rosso. Paris, Louvre, Inv. RF 52176. Red chalk and red wash over a preliminary drawing in black chalk, 21.4 x 11; laid down; wm.? PROVENANCE: Paris, Hôtel Drouot, Sale, March 7, 2001 (no catalogue), with a 19th century label on frame giving an attribution to Gericault; bought by the Louvre département des Arts graphiques. Cordellier, 2002, 90-91, no. 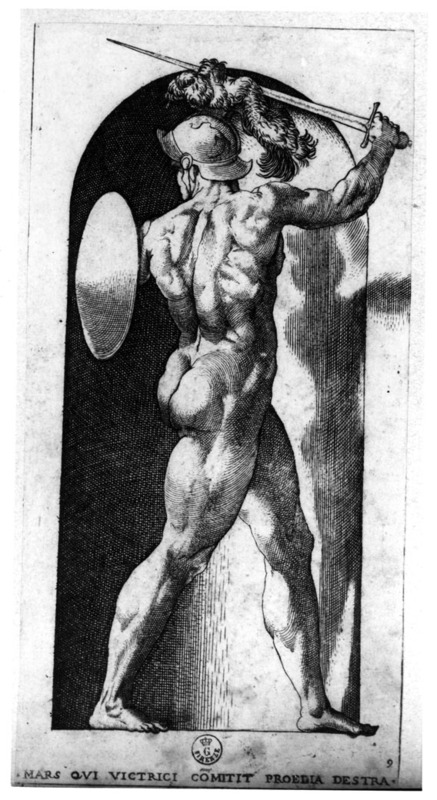 12 with color plate, as recognized by Pierre Rosenberg as one of Rosso’s drawings for Caraglio’s Gods in Niches. Paris, Louvre, Inv. RF 52177. PROVENANCE: Paris, Hôtel Drouot, Sale, March 7, 2001 (no catalogue), without an attribution; bought by the Louvre département des Arts graphiques. Cordellier, 2002, 90-91, no. 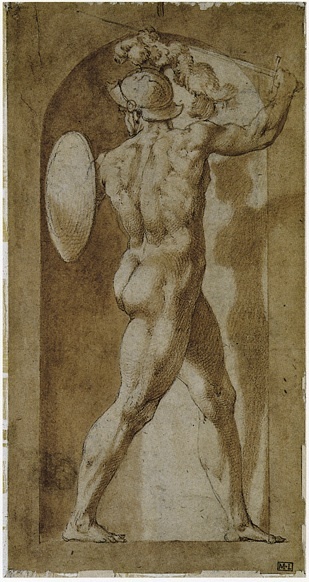 13 with color plate, as recognized by Pierre Rosenberg as one of Rosso’s drawings for Caraglio’s Gods in Niches. Besançon, Musée des Beaux-Arts et d’Archéologie, no. D.1444. Red chalk and red wash over outlines in black chalk, 21.5 x 11. Inscribed in ink at the lower left: D.1444. PROVENANCE: Jean François Gigoux (Lugt 1164); given to the museum in 1896 (Lugt, Supplément, 238c). Carroll, 1961, 448, Fig. 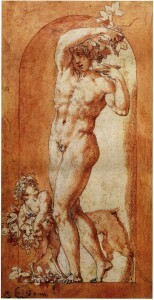 5, 449, as Rosso, and the model for Caraglio’s print of 1526. Carroll, 1964 (1976), I. Bk. I, 126-129, 132, Bk. II, 240-242, D.17, II, Bk. III, Fig. 61, as Rosso, 1526. Béguin, in Le seizième siècle…peintures et dessins, 1965-1966, 203, no. 248, 204, Fig., as Rosso. Shearman, 1967, 195, n. 33, as Rosso, and as for the print by Caraglio. Marita Horster, “Antike Vorstufen zum Florentiner Renaissance Bacchus,” Festschrift Ulrich Middeldorf, Berlin, 1968, I, 219, II, Pl. CXVI, 5, as Rosso, and as related to a statue by Praxiteles. 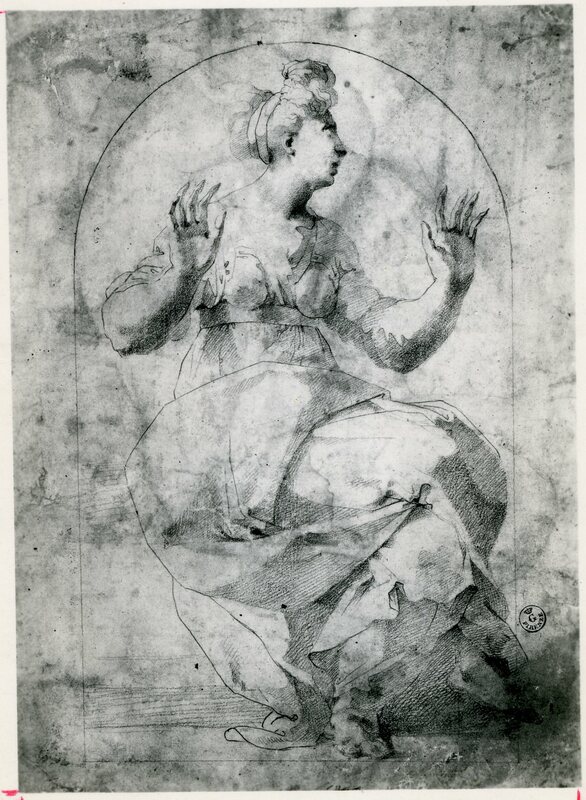 Thirion, 1971, 33, and n. 18, believes the drawing may be a copy after Caraglio’s print. Carroll, 1971, 25, as Rosso. Béguin, in EdF, 1972, 178, no. 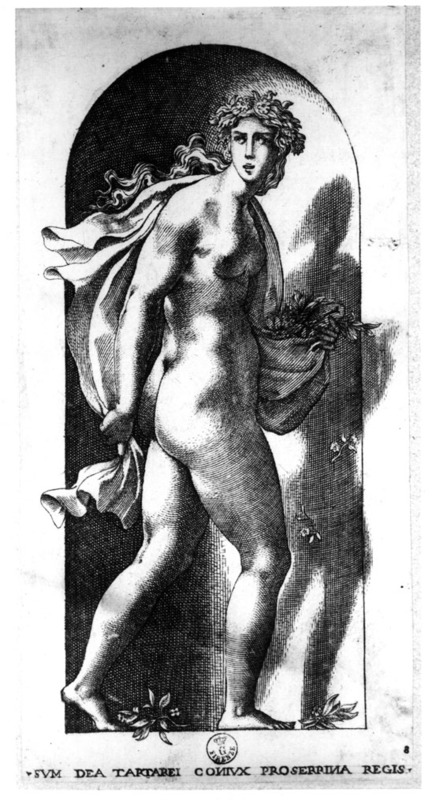 202, 180, Fig., as Rosso for Caraglio’s engraving. Marie-Eliane Béguin, in Renaissance, Quebec, 1984, 298, under no. 158. Lévêque, 1984, 163, 165, Fig. Henriette Pommier, in Dessins…de Lyon, 1984-1985, 26, under no. 2. Carroll, 1987, 9, 10, 24, 37, 39, 40, 98-99, no. 20, with Color Pl. Carroll, 1989, 12, Fig. 17. Landau, in Landau and Parshall, 1994, 159, 160, Fig. 167. Franklin, 1994, 134, 137, Pl. 101, as Rosso. Brugerolles and Guillet, 1994, 66, n. 5, under, no. 23. 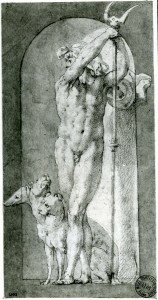 Cordellier, 2002, 90, noted it was recognized by Pierre Rosenberg as one of Rosso’s drawing for Caraglio’s Gods in Niches. Françoise Soulier-François, in Les Dessins du Musée des Beaux-Arts et d’Archéologie de Besançon, 2003 (2005), p. 24, with Color Plate, recognized the influence of Michelangelo and Andrea Sansovino, and the iconographic innovation of the god pressing the grapes into the cup he holds high up. These four drawings are related to four of the twenty Gods in Niches that Vasari says Caraglio engraved in Rome after Rosso’s drawings each specifically made as a disegno di stampa, Vasari’s term for a drawing executed as the immediate model for the printmaker. The four prints appear in the series as no. 7, Pluto (Fig.E.32), no. 8, Proserpina (Fig.E.33), no. 9, Mars (Fig.E.34), and no. 18, Bacchus (Fig.E.42). 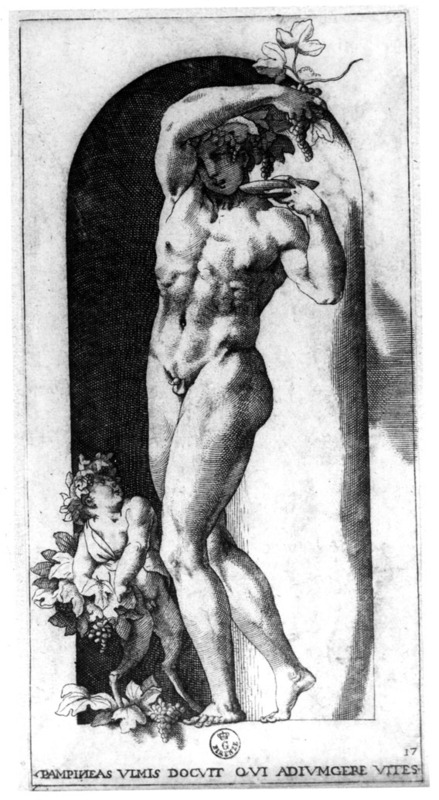 Only the first of the series, Saturn (Fig.E.26), bears Caraglio’s name and a date: 1526. 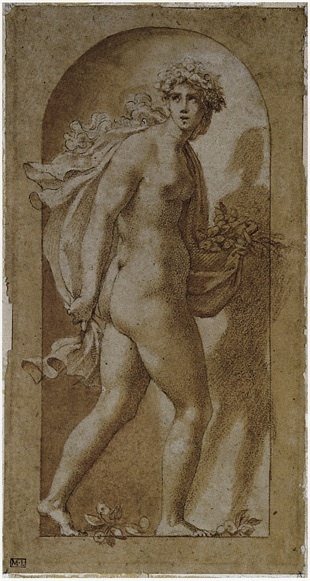 Rosso’s authorship is known from Vasari’s remarks on Caraglio’s career and in his Life of Rosso, and from the character and quality of the draughtsmanship of the drawings themselves. Clearly all four drawings were done by the same artist, and all are the same size as the prints to which they are related. Details of all four drawings differ from what appears in the engravings. 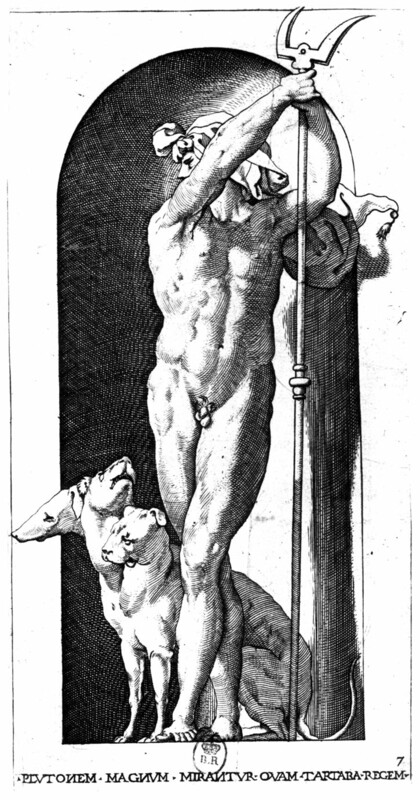 The hind quarters of the dog behind Bacchus are not reproduced in the print following through their cancellation with washes in the drawing, where also the underdrawing of the animal’s tail is not further drawn. 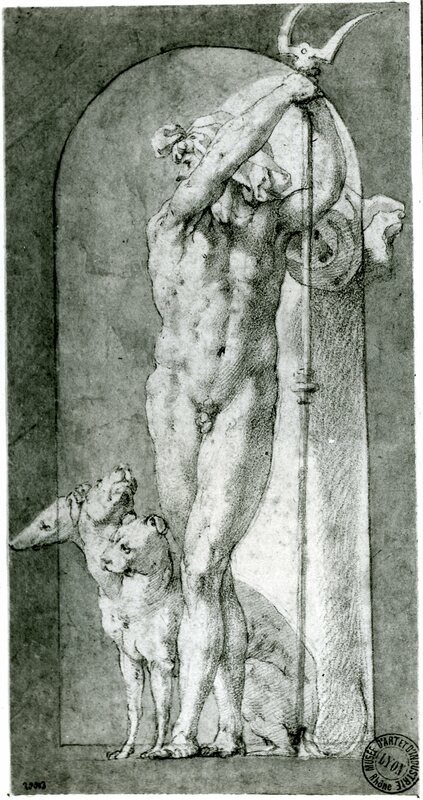 The outline of Pluto’s niche overrides the feet of Cerberus and the god as evidence of the working out of the design of the drawing that need not be copied by the engraver and unlikely to be reproduced in a draughtsman’s copy. None of the drawings reflect the precision of the engravings, even as the drawings appear to have been done to serve the engraver’s methods of cutting the designs into metal. Likewise, the Proserpina and the Mars show the fine touch of a careful draughtsman working for an engraver and not from his translations. All of the drawings show the walls outside the niches shaded, not white as in the prints, although later states of the prints bring back this feature. 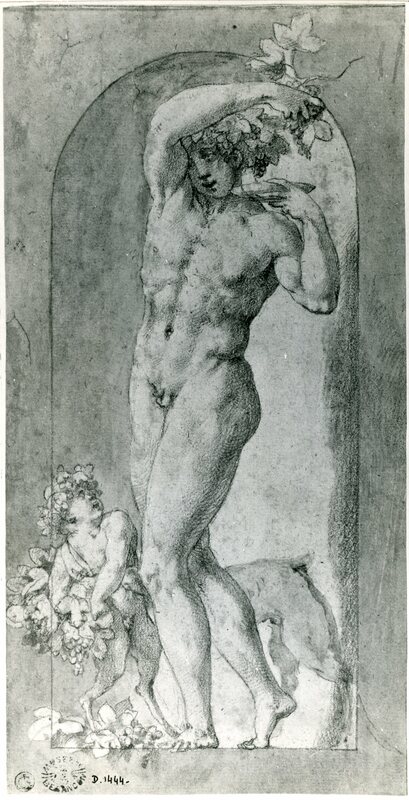 In their fine parallel shading, the drawings are similar to Rosso’s study of 1524 for the figure of Eve of the Cesi Chapel Fall of Adam and Eve (Fig.D.10) and the very slightly earlier study for the figure of St. Sebastian in the Dei Altarpiece (Fig.D.7). 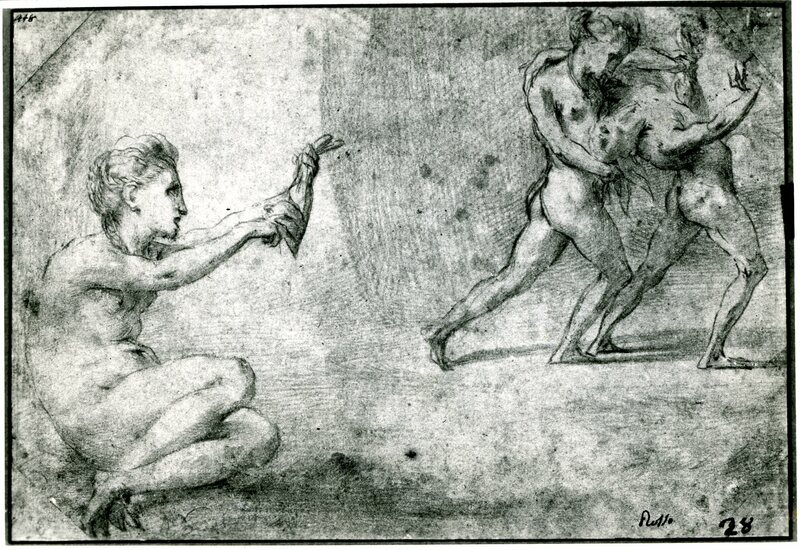 Comparable fine preliminary contours in black chalk appear in the “Virtù” Vanquishing Fortune (Fig.D.6a) and in the Seated Woman in a Niche of 1524 (Fig.D.11). 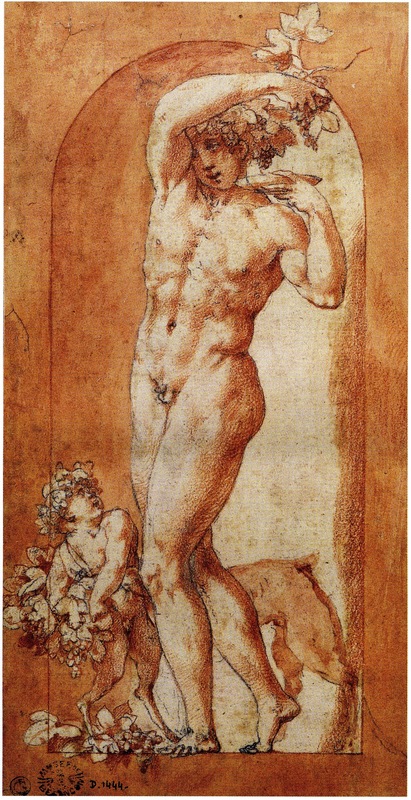 The red chalk of the disegni di stampe of 1526 is not quite so fine as in other drawings by Rosso of around the same time, a difference likely because the function of the drawings was to serve as models for an engraver who then created his own sculptural refinement upon the drawn images, a transformation that Rosso may well have foreseen as Caraglio’s prerogative.